In addition to fortifying their defense with high-end starter potential and valuable depth in bursts throughout the 2018 NFL Draft, the Denver Broncos made a clear effort to equip their new signal-caller Case Keenum with a bevy of rookie talent at skill positions. Opting against a trade down with the Buffalo Bills, Broncos general manager John Elway stayed put at pick No. 5 and selected former NC State edge Bradley Chubb, our second-ranked edge in the draft class. 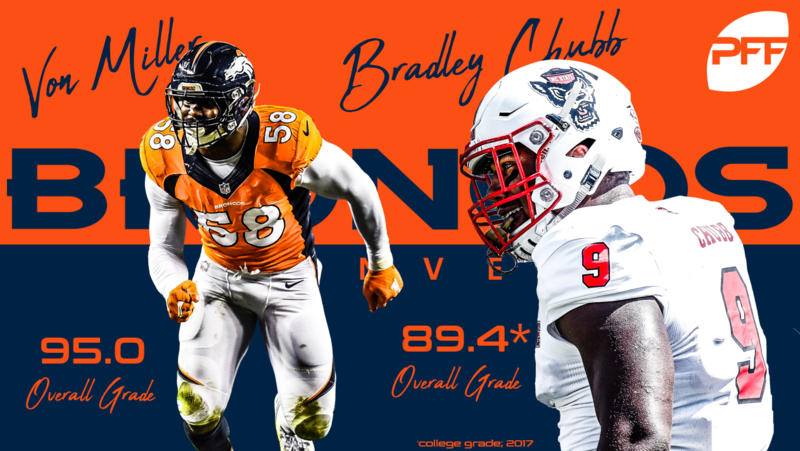 Fitting into a talent-laden rotation in Denver that includes veterans Von Miller, Shaquil Barrett and Shane Ray, Chubb has proven savvy as a both a run-defender and pass-rusher. He ranked No. 2 in run-stop percentage (11.0) and earned an 85.5 pass-rush grade in 2017. After Chubb, Elway spent three of his remaining nine draft picks on other defenders, including cornerback Isaac Yiadom and linebackers Josey Jewell and Keishawn Bierria. The 6-foot-1, 190-pound Yiadom adds instant value as a special teamer and high-arching potential given his favorable height and length. Of the two linebackers, Jewell stands out as a potential impact player in Year 1 in either a rotational or special teams role. Dubbed “The Outlaw” during his stint at Iowa, Jewell earned 85.9-plus overall grades in each of his final three years with the Hawkeyes. Upgrading the opposite side of the ball, Elway added three new pass-catchers to Keenum’s arsenal starting in the second round with former SMU wide receiver Courtland Sutton. At 6-foot-3, 216 pounds, Sutton has the size of a possession receiver but moves much better coming out of his breaks than other receivers of his stature. Sutton earned high overall grades in each of the past three seasons, including a career-high 87.9 overall grade in 2016. Denver dipped back into the class’ pool of pass-catchers at the start of Day 3, selecting former Penn State wide receiver DaeSean Hamilton and former Wisconsin tight end Troy Fumagalli. A nuanced route-runner, Hamilton can create separation on short and intermediate routes with the best of them, and he still has enough speed to stretch the field on deeper routes. He earned a career-high 85.2 overall grade in 2017. The former Badger, Fumagalli is smart enough to work the middle of the field and produce at a high level and he uses his 6-foot-5, 247-pound frame to his advantage when shielding defenders from the ball and has proven to be quite the route-runner. He ranked sixth in the draft class in yards per route run (1.87) and earned 83.5-plus overall grades in each of his two final collegiate seasons. The Broncos also revamped their backfield through the draft, releasing veteran C.J. Anderson and replacing him with two draft picks and a local UDFA. Former Oregon standout Royce Freeman should compete with projected starter and former fourth-round pick Devontae Booker for touches at the front of the rotation, while seventh-rounder David Williams and former Colorado running back Phillip Lindsay should compete for change-of-pace roles.